Maulbronn abbey is a former Cistercian abbeypresumably founded in 1147. 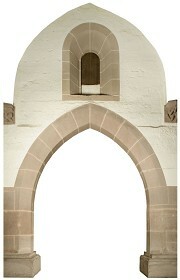 During the Reformation period the convent has been dissolved. But not only the church withcloister and the annex buildings have been fully preserved; the whole medieval monastery city and the civil buildingshave remained completely until today. In addition the whole area is still surrounded by a medieval city wall. According to this exceptional state of preservation the whole monastery complex area was declared World Heritage Site by UNESCO in 1993. 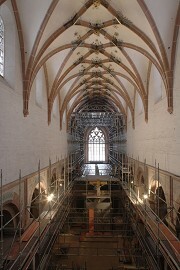 Since the beginningof 2010 extensive renovation works are in progress in the nave and the side-aisles of the monastery church. In order to permit the mapping of the results for the restorers, all Romanic wall areas as well as the corresponding vaults have been photographed. Afterwards these pictures have been rectified by measurement data. The underlaying plans originate from drawings of Peter Knoch and his office for building research located in Heidelberg. The project is special in that the photographs had been taken in both ways: analogic and digital. One characteristic project feature is the production of all pictures in both ways: digital and analogue. The analogpictureshad been made in addition to generate photographic material which is expressly is capable for long-term storage in archives in contrary to digital data files.